The Underground Circus is directed artistically and technically by two former Cirque du Soleil acrobats, and has been creating spectacular circus productions for over 10 years, and more that a thousand shows. From intimate vignettes to full scale modern circus shows, the Underground Circus takes pride in being the West Coast leader in technical skill and meticulous artistic production. With over 20 acts, including aerial, ground based, manipulation, comedy, and eight (so far!) 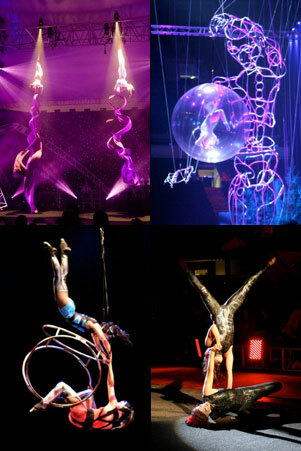 completely unique circus acts developed by TUC,, The Underground Circus can tailor a show to any theme.